We're in The Toronto Star! Earlier this summer, Journalists for Human Rights sent ten Canadian journalists to work in various newsrooms and j-schools in Ghana and Malawi, educating and empowering local journalists there to produce Rights Media (media that creates the imperative societal dialogue on human rights issues). 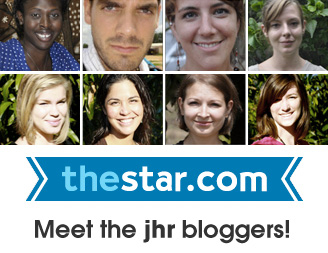 Now, these ten remarkable individuals are blogging in the Toronto Star to provide Canadians a unique, on-the-ground perspective on the human rights violations that occur everyday in these countries. Read their stories today and learn more about the work that we do in some of the toughest conditions in the world - http://thestar.blogs.com/africa/. "The bundles of paper are bound by brittle elastics, stuffed into broken-down shoeboxes and shoved under the bed. There are a colleague's reflections in fountain pen, so handsome they could have been written by a medieval scribe. Camp letters scribbled in haste by a son who couldn't wait to get back to his canoe. Words that slump with the homesickness of a sister living half a world away." So everything the article described is true, and it's something I've never actually given much thought about. Because really...who thinks about cursive writing as a daily activity? But as the author notes, "handwriting, like a human face, is unique and evolving" and it tells such evocative stories, so unlike the ones we read on our computer screens or smartphones. After reading the article, I rushed to my bedroom to reach for my box of birthday cards, love letters, and postcards...all items that seem to be from the distant past. And all the emotions that I felt when I first tore up the envelope of each card or letter came rushing right back...the joy, the giddiness, the disappointment, and even the indifference. I realize this might be ironic considering I'm blogging about this right now and the fact that I work so heavily with ICTs everyday as a part of my personal and professional life. And yet, a part of me is heart broken when I read about the supposed death of handwriting. Of course, I welcome and advocate greatly for our move towards technology...for those of you who know me, know how much of a positive force I believe it can be. But it's also true that "no emoticon can impart as much enthusiasm as an exclamation mark dashed off by hand". It seems we're letting go of a certain romance that I'm not quite ready to let go of. So is this the trade-off for the worldwide connectivity and ubiquity that our generation of technology provides? Are we only left now with a nostalgia, a memory for a time long gone? Have I just written the eulogy for that old, forgotten but ever beautiful art?